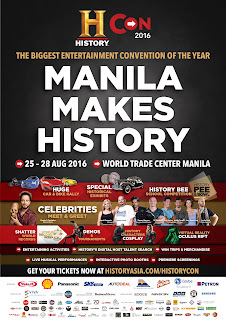 Manila, Philippines -- Mark your calendar as HISTORY Con, A+E Networks®’ HISTORY® Asia’s very first-ever convention, will be opening in Manila on August 25. This can’t-miss event is jam-packed with activities and displays that will bring the channel to life and immerse visitors in the HISTORY® experience. Like the channel, HISTORY Con will be epic in scale and cover a broad range of genres and interests, with dedicated areas for the paranormal/sci-fi, survival and adventure, motoring, history and culture. The four-day ticketed event will be held at the World Trade Center and will be opened to the public. The convention passes are now available for sale at HistoryAsia.com/HistoryCon.